Our Saviour Subject to His Parents at Nazareth by John Rogers Herbert. 1847. Oil on Canvas, 32 51 inches. Collection: Guildhall Art Gallery, London. Photograph by George P. Landow reprodiced courtesy of the Guildhall Art Gallery, which retains copyright. A passing cloud of Golgotha would spread." This picture presents three figures --Joseph, the Virgin, and our Saviour in his youth. The immediate scene is before the door of Joseph's house, looking out upon a region of arid and sterile aspect, which the catalgue informs us is "painted from a very careful drawing made at Nazareth" — a matter of little consequence, and of no value. 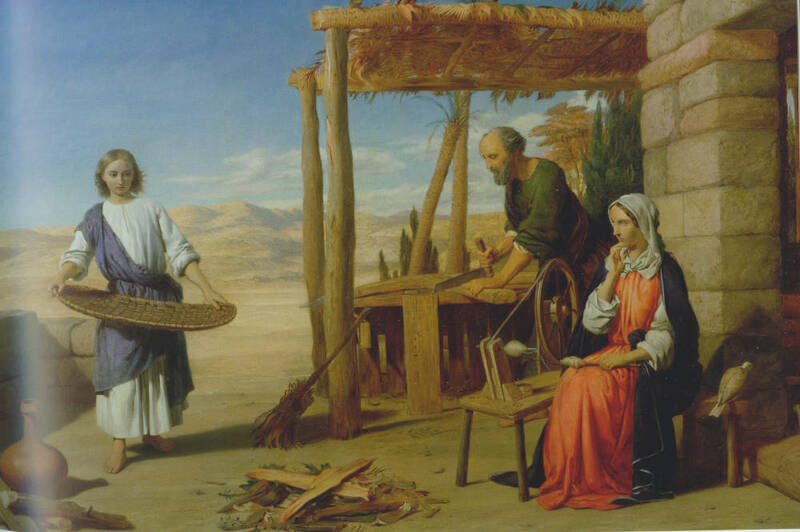 Joseph is in the act of making a plough, while Jesus is coming with a basket to pick up some chips which have been swept together on the ground. The Virgin is seated at her wheel; she ia not actually spinning, but regards Jesus with an extraordinary intensity of expression. The style of the work is a deduction from early Italian Art modified by more advanced experiences. It is a work of much merit; but most defective where we should most look for excellence; the character of the Saviour — in youth — has been utterly mistaken; there is in it nothing of that high feeling and perfect grace — grace of heart as well as mind — inseparable from our ideas of the character: the expression is, indeed, rather repulsive than inviting ; it gives us no glimpse of the mighty hereafter of the Divinity who had taken our nature upon him. Both the painting itself and the reviewer's statements about it prompt several remarks: first, Herbert's canvas clearly anticipates both Millais's Christ in the House of His Parents and Hunt's The Shadow of Death: it has the child trying to help Joseph, the carpenter, of Millais's painting and the mother's intense gaze of Hunt's. Second, the accompanying text make the painting a prophetic image. Third, he comment also reveals how little concerned with authentic settings was this important review and how much it assumed that depictions of Christ had to present an idealized Christ rather than one engaged in daily activities [GPL]. "The Royal Academy." Art-Journal 9 (1847): 189.